Indiana Canine Assistant Network at IU is training service dogs. Puppies delivered Valentines in an initiative called Puppy Love Valentines. Sisters Alacoque Burger and Evelyn Forthofer care for aging sisters and maintain hope. To serve populations hit hardest by war and poverty is all Humam Yousef wants. 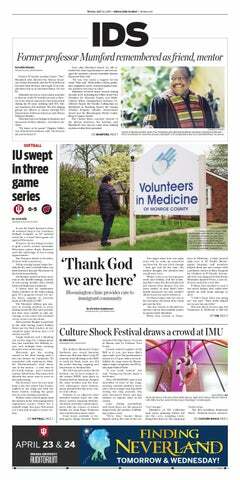 IU's emergency team jumped from one to four. The student group parsed through facts and composed emails to faculty and trustees. Though the station will join the Media School in Franklin Hall, it will remain autonomous. The alliance continues work toward becoming a sanctuary campus and raising funds. The department continues to train officers and the community for active shooter scenarios. The department is willing to play any team from campus and the community. The new superintendent of public safety plans to focus on community policing. Native Americans in the community spoke about the roots of the NoDAPL movement. The activist group divided into committees for education, safety, collaborations and refugee support. IU professor Elizabeth Dunn refuses to halt work welcoming refugees to Bloomington. Those in attendance differed in origin and ideals, but they stood together. Students and faculty parse through the significance of party platforms for the LGBTQ community. Amid smashed pumpkins and Pizza X cups was a relatively uneventful holiday. Until Thursday, anyone can attend classes focusing on Islam and Islamophobia. Smoot spent his days leading others to comfort and joy.